As part of the first comparison study of central pit impact craters throughout the solar system, professor Nadine Barlow of NAU's Department of Physics and Astronomy recently published findings revealing insights into the environmental conditions governing the formation of these craters. Central pit craters are impact craters caused by the collision of asteroids, comets or meteorites that feature a central depression. These pits, located either on the crater's floor or on top of the crater's central peak, are between 100 meters and 190 kilometers in diameter and are found in craters that range in size from five kilometers to 450 kilometers in diameter. Central pit craters exist on a variety of bodies with different target properties, gravities, geologic histories and surface temperatures. Barlow, a planetary scientist and one of the world's foremost experts on Martian impact craters, is the lead author of the paper, which was published in Meteoritics & Planetary Science. The paper presents the results of research conducted by a team of scientists on central pit craters on Mars, Mercury, Jupiter's largest moon, Ganymede, and Saturn's moons Tethys, Dione and Rhea. "In this study we compared the characteristics and distributions of central pit craters on Ganymede, which is a large, volatile-rich body; on Tethys, Dione and Rhea, which are smaller, volatile-rich bodies; on Mars, a body with an intermediate amount of crustal volatiles; and on Mercury, a body with a low-volatile crust, to determine similarities and differences between central pits on different bodies," Barlow said. Volatiles are chemical elements and compounds with low boiling points that are associated with a planet's or moon's crust or atmosphere, including nitrogen, water, carbon dioxide, ammonia and methane. Although scientists conducted research on these craters in the 1970s, when many of them were detected, Barlow decided to take another look. 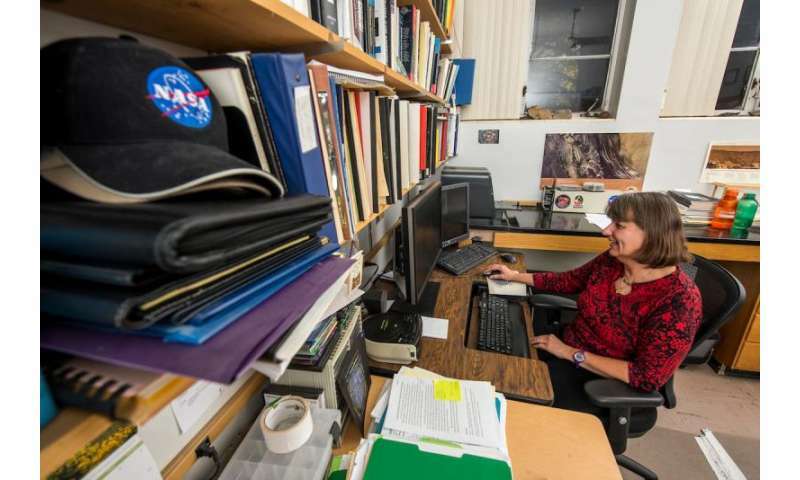 "We have all sorts of new data sets available now for these planets and moons, including higher-resolution image data as well as information about their dust content and topography—so we wanted to look at them again using the newer data sets," she said. Based on earlier research, scientists believed the smaller moons were not large enough for central pit craters, but the team identified 10 more central pit craters on Rhea, Dione and Tethys using the new data. "Until recently we thought pit craters only occurred on bodies with water or ice on their near-surface regions," Barlow said. "The majority of the models for how these pit craters formed, in fact, were based on the theory that ice or water on the surface vaporized or drained upon impact. But central pit craters also appear on Mercury and on the moon, which do not have ice or water on their near-surface regions." The investigation found that pits on the floors of craters are more common on icy bodies and are larger relative to their crater than pits on central peaks. While the central peak analysis found no difference between pitted and unpitted peaks, it did indicate Mercury's crust is twice as strong as Mars' crust. The study also found central pit formation involves initial uplift followed by collapse. This study is part of a larger ongoing investigation comparing central pit craters across all solar system bodies, the results of which will provide comprehensive new insights into whether a single formation mechanism can explain central pit formation on both volatile-rich and volatile-poor bodies. Barlow's analysis eliminated some models previously proposed by scientists explaining central pit formation. Her findings suggest the actual formation process is a complicated interplay of crustal strength, surface gravity and energy of the impacting meteorite. Barlow focuses her research on impact craters and what their presence reveals about the distribution of sub-surface reservoirs of water and ice. Other research topics she is pursuing include analyzing crater relationships to thrust faults on Mercury to determine whether the planet is still shrinking, identifying features indicative of the freshest impact craters on Mars and investigating how climate change on Mars has influenced crater formation and erosion.